Hey there! 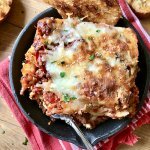 This weeks drop dead delicious recipe is Slow Cooker Lasagna! 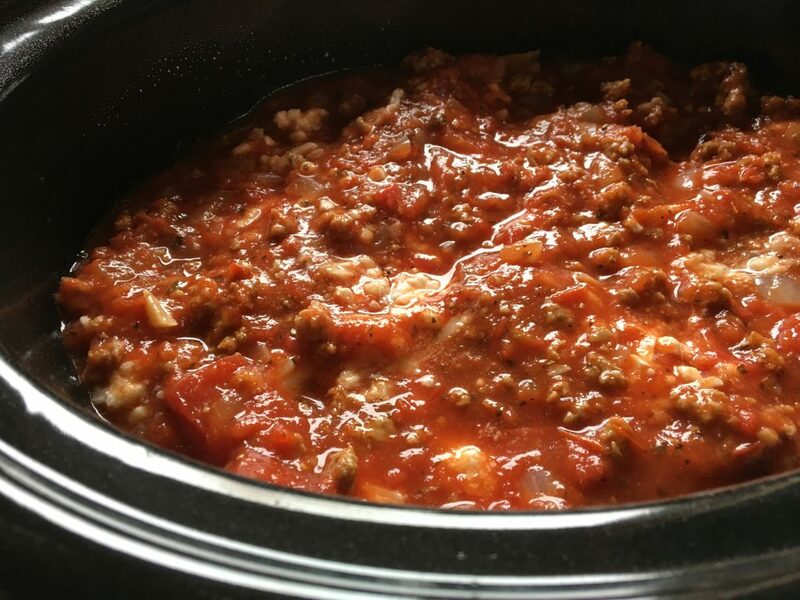 Slow Cooker Lasagna made healthier by using 50/50 of lean ground turkey and lean ground turkey sausage. It also has three cheeses. I repeat three cheeses! This is not a drill. 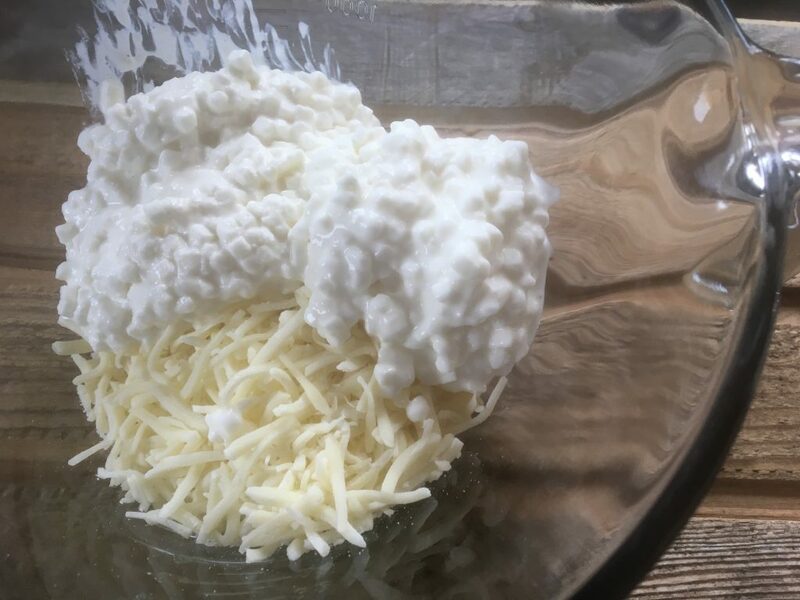 Parmesan cheese, mozzarella cheese, and cottage cheese. Don’t stop reading. I promise you it’s delicious. It’s all wrapped up with lasagna noodles and a quick n’ easy marinara sauce from scratch. I’m actually chowin’ down on this reheated as I type this and oh man, this is totally one of those ‘tastes even better the next day’ type dishes. It tasted real good last night, but I think I might eat this for breakfast, lunch, and dinner tomorrow because I am an adult and I can do what I want. Last week, I made this for the first time, and it was just alright. But I’m a perfectionist, so I made it again this week. 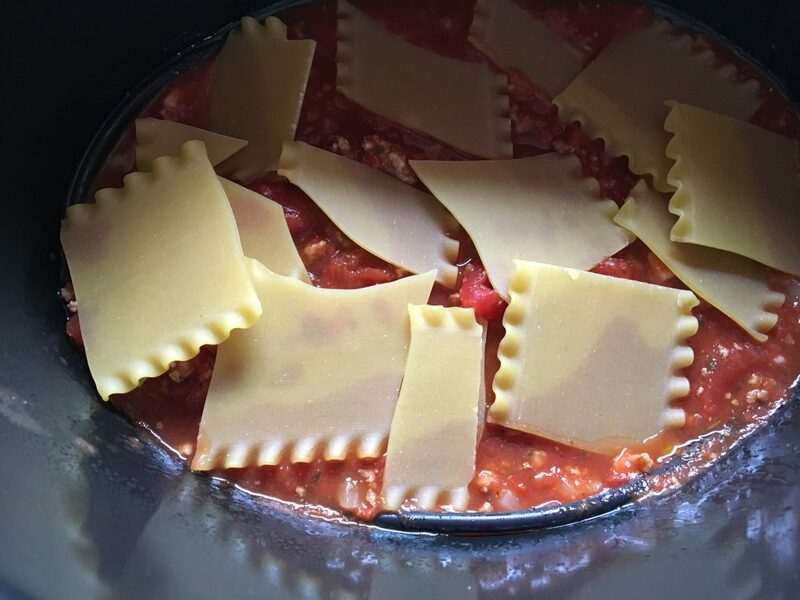 The first time, I think I added a bit too much water to the sauce, and it didn’t cook properly in the slow cooker, because It was just a bit too “soupy” for my lasagna preference, and the flavor was a little flat. This batch though? It’s AMAZING! I’ve never, ever cooked lasagna in a slow cooker before last week. Actually, I’m pretty sure I’ve never cooked any kind of pasta in there. I’m usually a stove top and oven type of girl, but I’m journeying more and more into the slow cooker world. (As a lot of people journey into the Instant Pot world haha!) You want to know the number one reason why I love my slow cooker? I just love the smell that permeates throughout the house for the entire day! I also love that I have dishes done before dinner time, so I can relax with Eric and Pepper before her bedtime. 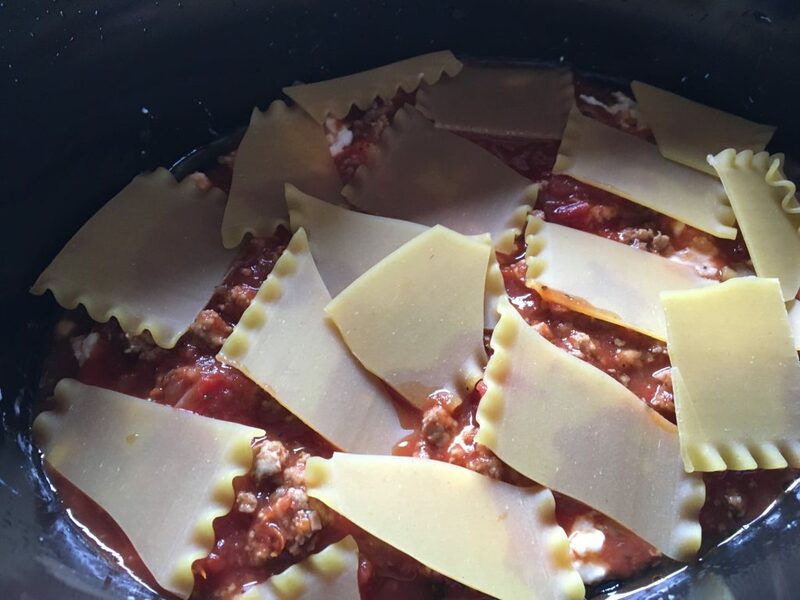 The idea for Slow Cooker Lasagna came by request from my lovely sister and some of her co-workers. 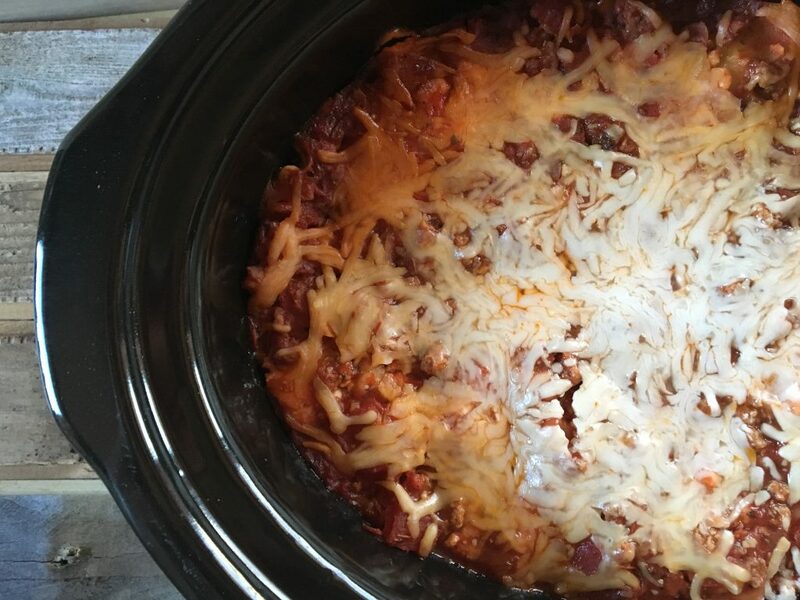 They wanted a healthier crock pot lasagna! Ask and you shall receive… eventually… probably, unless it’s oysters. Go somewhere else for that. So, here you go, gals! I think you’ll love it. I know I love it. Eric went on and on about it. Pepper ate lots of it.. but I had to add extra cheese. She’s having a ‘more cheese please!’ phase. Is that actually a phase? I don’t think there’s ever enough cheese. But, she still won’t touch macaroni and cheese, try and figure that one out. You get a real ‘bang for your buck’ when it comes to portion size. So here we go… Let’s get into the kitchen, folks! 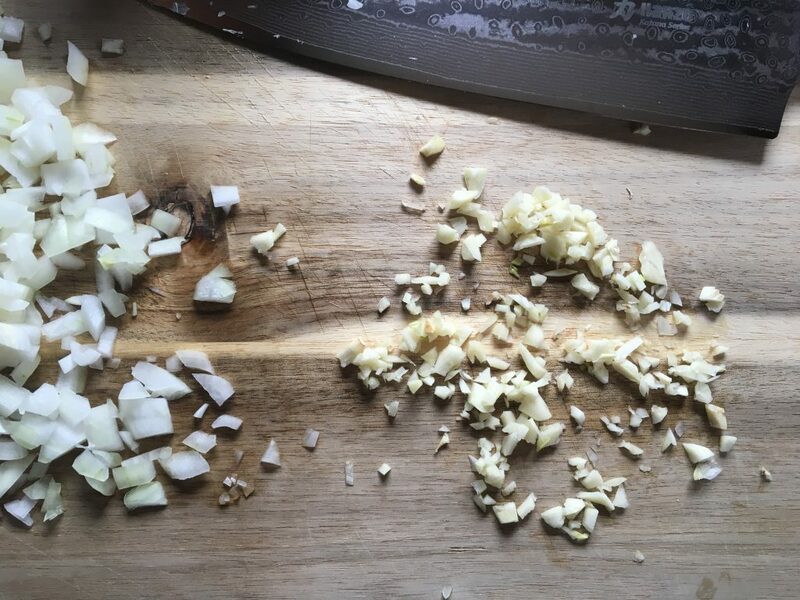 Grab a medium yellow onion, and chop it up as evenly as possible. 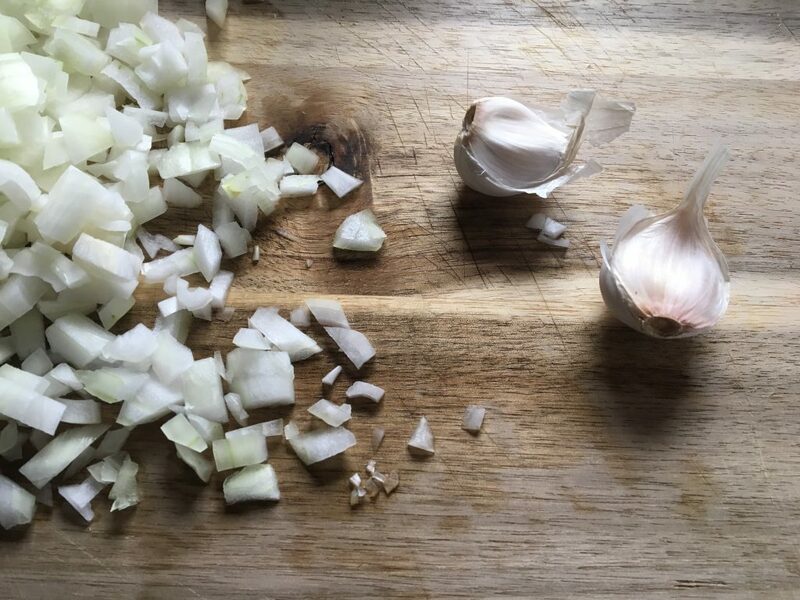 Then grab a few cloves of garlic..
Mince the garlic as finely as you can. I actually noticed some pieces were a bit bulky, so I put it under the knife once more after this shot. 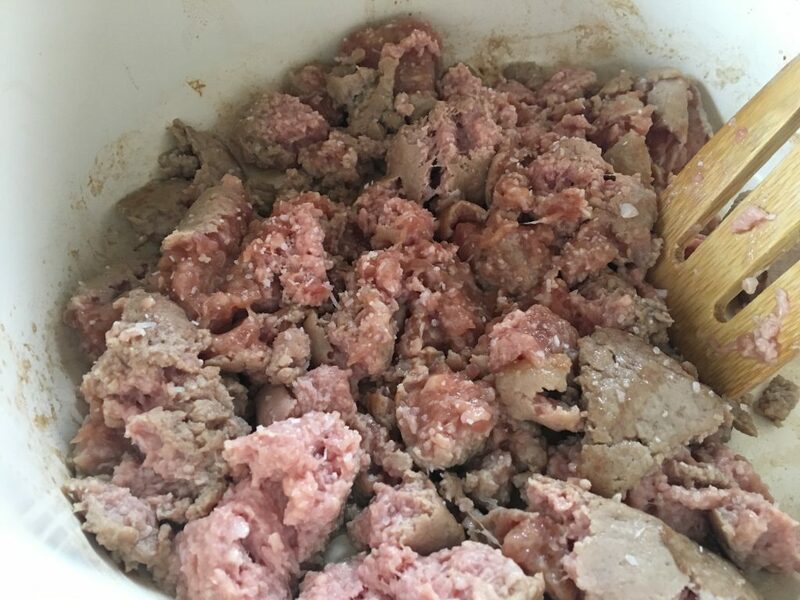 In a large stock pot and throw in half a pound of Italian Turkey Sausage (I use Jennie O Sweet Italian Links with the casing removed from the links), and half a pound of lean ground turkey. Throw a bit of kosher salt (about 1/2 teaspoon) on it while you’re at it. I use a mixture because I find the sausage taste overpowers if you only use that. It’s a personal preference, honestly. You could use all sausage or all turkey, but in my humble opinion the mixture of both is where it’s at. 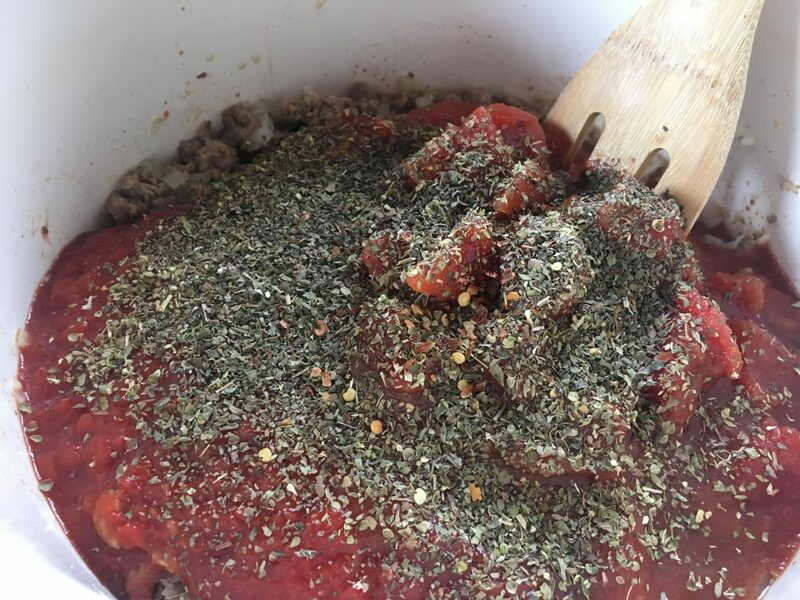 If using just the ground turkey, I recommend sprinkling about one teaspoon of Italian seasoning on it while browning to give it a bit more flavor. 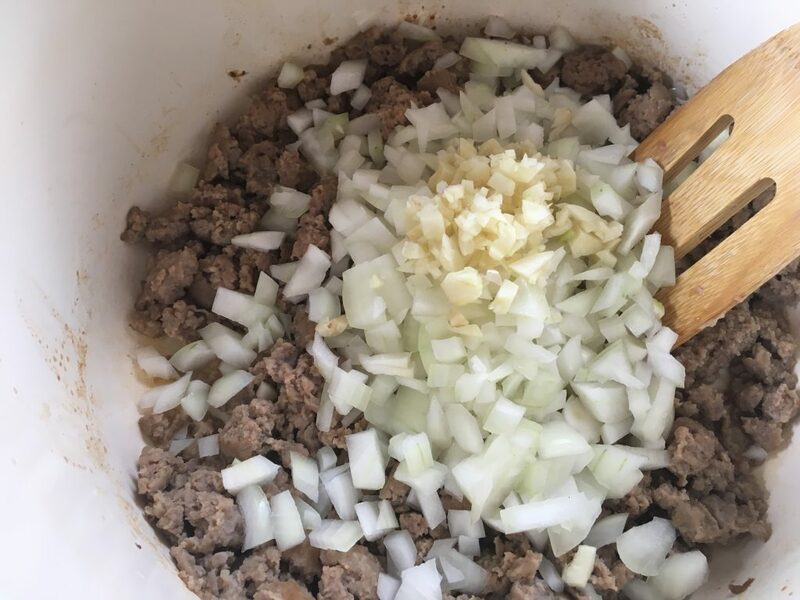 When the meat is mostly browned, add the onions and garlic, and cook until soft. Now add a large can of crushed tomatoes, and a can of diced tomatoes. (You can use tomato sauce in place of this, but I like the extra texture of crushed tomatoes!) Add 2 tablespoons of Worcestershire sauce, 2 teaspoons dried basil, 2 teaspoons dried oregano, 2 teaspoons salt, 1 teaspoon pepper, and a couple shakes of red pepper flakes. Also 1 cup of WATER! Do not forget the water. It needs water to ensure the noodles cook properly in the crock pot, because we won’t be cooking the noodles beforehand. Mix it all up, cover the pot, and simmer for about 10 minutes. 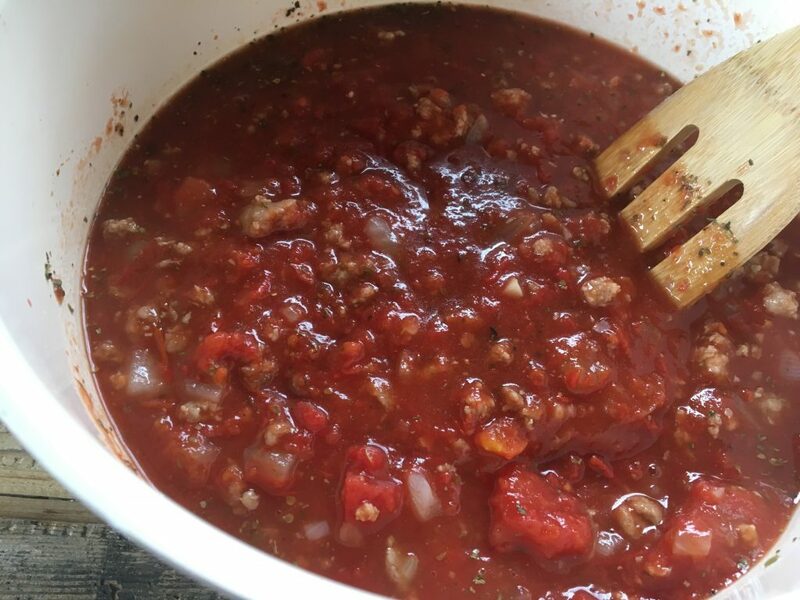 While the sauce is simmering, grab a bowl and mix up my favorite part; The cheese! Add 2 cups cottage cheese, 1 1/2 cups mozzarella cheese (reserve 1/2 cup for later), and 1/4 cup parmesan cheese. I was so excited that I was able to use this much cheese while still keeping the points/calories in check. Mix it all up! P.S.- If you’ve been reading my recipes for awhile… you know I HATE cottage cheese, but I cook with it because it is PERFECT to cook with. Spray the crock pot with a bit of cooking spray, and then add about 1 1/2 cups of sauce at the bottom, followed by a layer of broken-up lasagna noodles. Spread 1/3 of the cheese mixture on top of the noodles as evenly as possible. Now yet another layer of sauce! More cheese! I apologize for all the repetition. But remember, layering is everything here- it’s what lasagna is all about! Top with the remaining sauce, and mozzarella cheese! Cook on low for 4-5 hours. If you’ve been making lasagna for a while you probably know that it needs to sit 10-15 minutes after cooking so it kind of all “forms together,” ya know what I’m sayin? There must be a technical term for this process. I feel like this also rings true with the slow cooker method. I turned the slow cooker off, and while I was making side salads and toasting bread in the oven, I just let it sit with the cover slightly turned. It was a total of 20 minutes, maybe. By all means, you can dig in right away, but it will be a bit sloppy and you want the noodles to kind of hug the sauce and cheese a bit. My second favorite part about this is that the serving size is HUGE, which means a lot to a girl watching her weight. A bit messy… but oh so scrumptious! Eric came home from work and said it smelled like just an Italian Eatery! He was fairly unimpressed with the one that came out of the kitchen the week before (He’s got pretty high standards these days, insert eye roll.) But alas, He couldn’t stop raving about this one, and honestly the only thing I changed was the amount of water, and I threw some salt on the meat while browning it. Voila! *drools* I hope ya love it up! 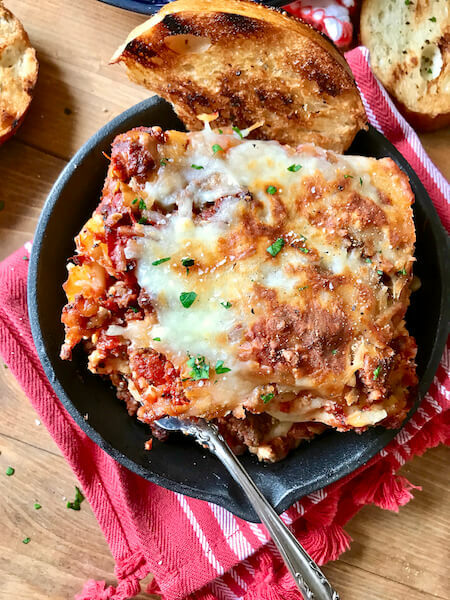 a lightened up, slow cooked Italian favorite, with layers upon layers of cheese, and a from scratch sauce! In a large pot, add ground turkey, ground Italian turkey sausage, and sprinkle with a bit of kosher salt. When the meat is mostly browned add onions and garlic, cook until slightly softened. Add crushed tomatoes, diced tomatoes, salt, pepper, basil, oregano, worcestershire sauce, and water. Stir together and simmer for about 10 minutes. While the sauce is simmering, Add Parmesan cheese, cottage cheese, and 1 1/2 cups of mozzarella (reserve 1/2 cup of mozz) into a bowl, and mix together thoroughly. Take your slow cooker and spray lightly with cooking spray. 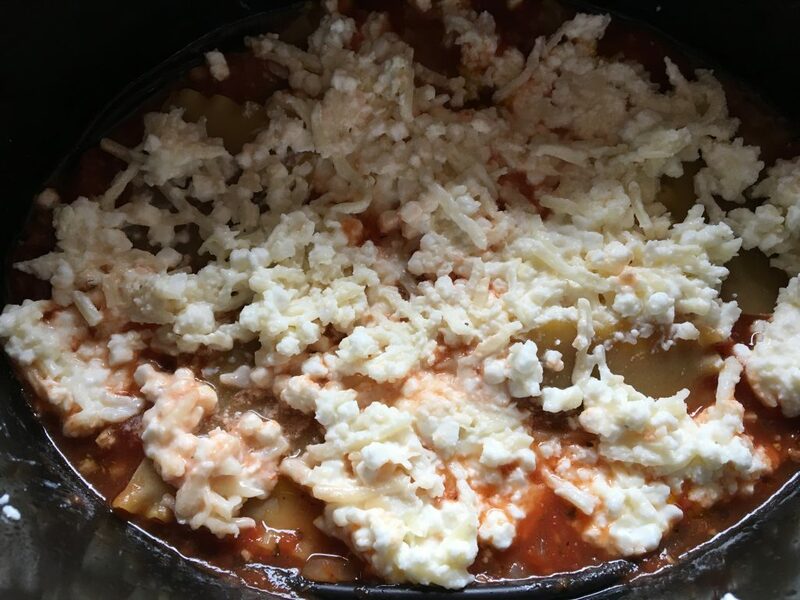 Add 1 1/2 cups sauce to the bottom, lay the broken lasagna noodles on top, then about 1/3 the mixture of cheeses, followed by about 1 cup of sauce. Repeat layers twice. Top with remaining sauce, and sprinkle 1/2 cup mozzarella cheese on top! Cover and cook on low for 4-5 hours. I’m SO glad everyone loved it at your church!!! What size crockpot did you use? Making this tomorrow for dinner! I’m 97% sure my crockpot is a 6 quart! I hope you love it! I think that should be fine! It’d be more like a lasagna style pasta, but still yummy! I’d just layer them as you would the lasagna noodles. You might not get as many layers, but that’s okay just stuff them full. I love this recipe. Even my picky eater daughter loves it. I still haven’t told her or my husband that it has cottage cheese in it. I thought gross when I first read that but you made a believer out of me. Getting ready to dish it up right now. Yet another amazing recipe! I’ve fed my family from Thisbe website for at least two weeks now and everything has been delicious! 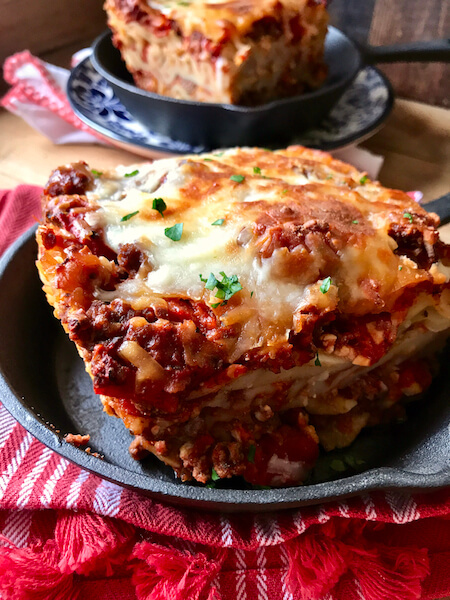 From pickle chicken, chicken salad, tuna salad, roasted corn and onion pasta salad, this lasagna…. all so very delicious! Thank you so much for the recipes!! They are always great, family loves them and I’m doing well on my WW plan! Win! Anyway, thanks again! Has anyone tried to make this in the oven? Im worried that it will get mushy if it stays on warming mode for the 5 hours I’ll be away at work. You can definitely make it in the oven. This is very similar to how I make my regular lasagna. You’ll just need to cook the noodles according to package instructions before hand, layer it just like the directions here, cover with foil, and bake in the oven for bout 45 minutes at 350! I hope you enjoy! Has anyone tried making it in an InstantPot instead of a slow cooker? Was hoping to shorten the cooking time so I could make it on a week night. Maybe I missed it, but how much black pepper? It’s listed in the directions, but not the ingredients. I kind of just guessed. It’s in the Crock Pot now and smells wonderful. Also with Freestyle the points should be a little lower, right? Thanks for the recipe! We made this for friends the other night and it was DELICIOUS. Both toddlers loved it too. The husbands didn’t even know it was turkey instead of red meat in there. Thank you, thank you for this yummy recipe, I will definitely be making it again and it is PERFECT for a crowd! I’m so happy you and the family enjoyed! My only negative was that it took a long time to prep, something I couldn’t do quickly in the morning before work, but it was great for a Sunday supper! Any idea if you can cook this for like 8 hours on low? This lasagna is AMAZING. My husband and I are obsessed. 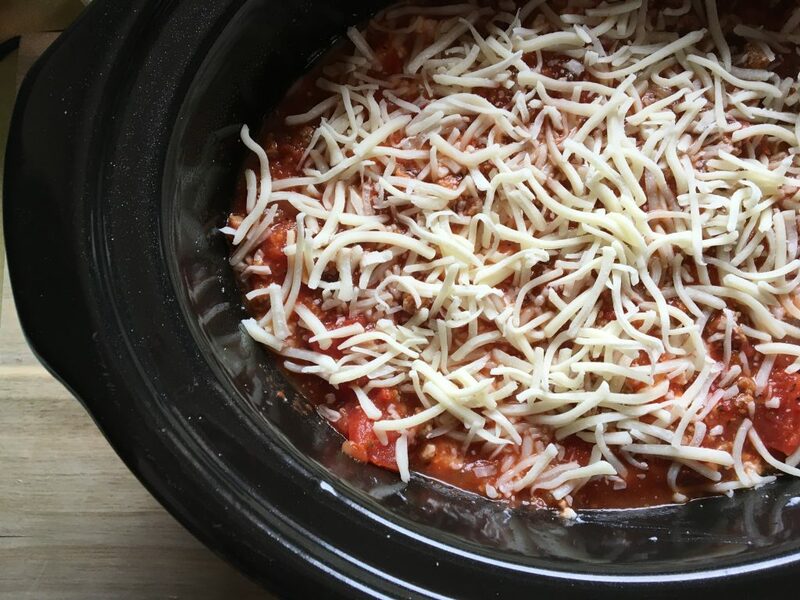 This has become our regular Monday night meal because it’s weight watchers meeting night and it’s so easy just to put it in the crockpot and have dinner ready as soon as I get home from my meeting. Thanks for making it possible to make lasagna without an insane amount of points! 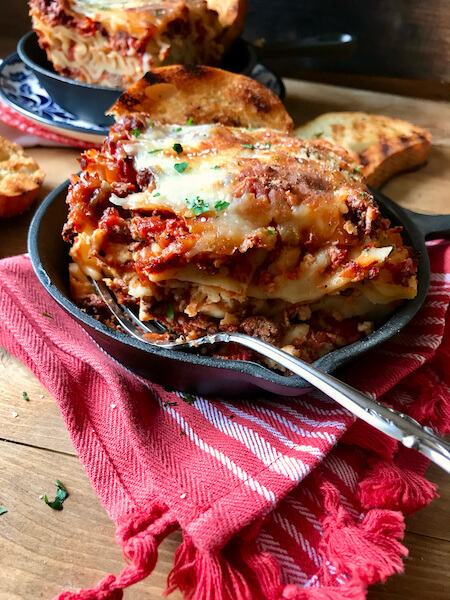 Monday night lasagna sounds PERFECT! So happy you and your husband enjoy this. I love this recipe too and I still can’t believe sometimes that it’s Weight Watchers friendly! haha! I made this for my family this week. It was freaking amazing!! The flavor was perfect, and the pasta cooked up great! (I worried about the pasta!) This will def be how I make lasagna from now on. Thanks! So so happy you enjoyed! 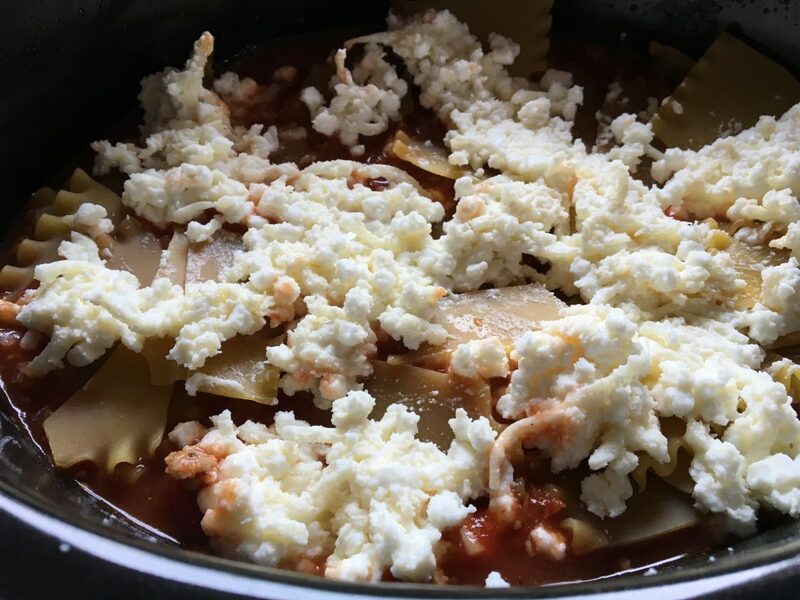 I failed the first time I tested out this slow cooker lasagna the pasta came out as moosh, but a few adjustments and it was perfect! This has become my new favorite way to make lasagna. I don’t have a food scale so do you know what the portion would be in cups?? It would be about 1 1/2 cups. I hope you enjoy! First of all, this was amazing! I made it tonight. And I love that you can have so much…11.5oz is a large portion. So yummy! However when I plugged in the nutrition info. I got 11SP, not 9. Can you clarify? Thanks! The nutritional info provided always includes everything in the recipe where as the points information does not because Weight Watchers does not calculate fruits and vegetables to have calories, sugars, etc sometimes when doing this the recipes won’t add up the same in nutritional info and points values. Hope that helps! That makes sense! I appreciate you clarifying. I didn’t think about that. It was so yummy! I had leftovers for lunch. My husband loves it & I even took some to my parents & didn’t tell them it was healthy. And my dad loved it and said he would’ve stayed home & ate that instead of going out to dinner had he known I was bringing him some. So easy to make, so yummy, definitely going to be a favorite in our house. I also love that you included the ounces because I like to weigh everything. So great! Thanks again! also, so happy you enjoyed! can i use something other than turkey sausage for same calories or less. You can use all lean ground turkey. The only thing I would suggest is sprinkling about 1/2 tablespoon of italian seasoning on the meat while browning to really season it well, but you don’t have to do that if you don’t want to! Do you think you can leave the cottage cheese out? My family really doesn’t like it. I had plans to have company over yesterday evening, and I wanted to make something I could easily throw together in the Crock Pot so I wouldn’t have to slave over a hot oven making enough food for a small crowd. So I made this. And it was a hit! Everyone raved about it. I heard things from, “This is the best lasagna I’ve ever had” to “I’m a picky eater and I love it” to “I can’t believe this is healthy”! It was absolutely phenomenal. Another delicious DDOP recipe for the arsenal. Thanks Star! If I sub the crushed tomatoes for tomato sauce, are the ounces the same? 28 for 28? Not sure my super picky hubs will wear crushed (eye roll emoji). Thanks!! Yes, It would work the same, I hope you enjoy! LOVED it! I actually used low-fat ricotta and it was yummy!!! Thank you for sharing! Good to know the ricotta tasted good in this too! I am happy you enjoyed! Yes, good to know! Thanks!!! I think it would be just fine if you’re a bigger fan of ricotta! double check points/calories if you’re tracking/counting calories! This was a family FAV! Ah-Mazing!!! I make a lot from your blog, so thank you!! It is working really well with my WW plan and I am consistently losing weight and enjoying YUMMY food! I am so happy the family enjoyed and that you’re able to feed everyone and yourself the same thing! It’s so much better than making two dinners.. or worse just having a sandwich or something while the family feasts! OMG this looks amazing! One question, these are the regular lasagna noodles right? Not the ones that are ‘no boil’ lasagna noodles. Appreciate your feedback! I made this today. It smells fantastic and it tastes superb! So funny when I read ricotta I was like yuk I’m leaving it out but then read your comment about hating it…so I figure you can’t taste it? You absolutely cannot taste. I’ve been seeing recipes for years (not even lightened up ones) that use cottage cheese so a few years ago a gave it a whirl and I was pleasantly surprised! I’ve been using it as a “creamy” factor ever since and bonus it’s super low in points! Can’t wait to try this. Thanks for adding the approx. ounces. That is very helpful for me. I prefer to weigh when possible. Had your kickin’ chicken past tonight and it was soooooo good. I’m going to try to post the ounces (when I remember) from now on. I personally really like to weigh too, however, with this one it was almost a must because you can’t cut 8 servings very easily in a crock pot! I hope you enjoy! I’ve tried to find the recipe for Kickin’ Chicken and can’t seem to locate it. Is it possibly called something else? Thank you. Hi there. An you advise how many ml of the crushed tomatoes and diced tomatoes ? Looks amazing! 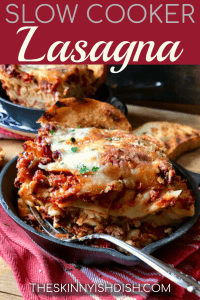 Next week I’m making this yummy lasagna! This was great. Only changes made was to use less salt (cut it from 2 tsp. to 1 tsp.) and still felt it was a bit too salty. Will try 1/4 to 1/2 tsp. next time. Also added fresh spinach on each of the 3 layers. Four hours was more than sufficient time to cook it. May even try less next time. I tried to rate it 5 stars, but the field was not updatable.